We talk with each other about Climate Change, the heedless exploitation of the planet's resources, and global violence which unjustly threatens the most vulnerable of life forms, human included. I try to think of ways I can make a positive difference, in agreement with Joanna Macy: "We have to hold our despair. We have to hold our hope ... and weave them together." Mostly, I feel quite overwhelmed at the magnitude of the damage, the injustice, and the truth that we just can't go on consuming this way. 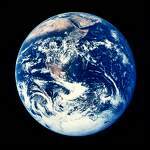 But, we must think globally and BE part of the "Human Change" in how we inhabit our Earth. What might it mean for us to understand ourselves as the universe beginning to be CONSCIOUS OF ITSELF AS THE UNIVERSE, as an interconnected whole, trying to understand our past so that we can shape our future appropriately? And how might our faith help us shape that new understanding? Then NOW is our moment of grace. It is time to break out of past boxes. I am the "Universe becoming conscious of itself." Beyond the muddle of my mind's grasp, in the challenges of climate change and all the frightening possibilities that come with it, the Spirit of God, sustaining all being, moves among us. Beyond all human greed and violence that seem so discouraging, the Word calls us to listen to Truth. The truth is that, in the long view of existence, the Creator, with infinite love, is still creating, and calling us to re-awaken to the wonder of being. Humans are not in charge, but we are called to live in harmony with all of God's creation. As in arrogance we have caused harm to Earth, in humility, we must walk here as a source of healing and renewal. Truly, human beings can't "turn off" climate change. But, being capable of cooperation, justice, and compassion, we have the potential to walk together into our future ready to adapt to whatever challenges it holds. Jackie Graham, PBVM, is active with her Congregation's Environmental Focus Committee, Sunnyvale Sustainable Gardens, San Jose Symphonic Choir. She works with autistic children as a sub. Instructional Assistant, along with doing Creative Activities at a home for Developmentally Challenged adults. Jackie is compiling a booklet of these activities for children and adults with special needs.